There has been a lot of property work done over the last few weeks with some ongoing, have a wee read and check out some of that work! Conference 2018 - Panoni - Celebrate! Challenge! Change! A big thanks to those of you who have provided conference feedback through the link in last week's Kōrero. If you haven't already please take the time to provide your feedback as this helps us shape future conferences. If you missed the link last week, you can complete the survey by clicking here. There were some amazing and thought provoking speakers over the two days and we hope you are continuing to feel inspired by what they had to say. Looking for the slides as you and your team follow up on conference presentations? Go to the Teachers Toolbox in Storypark. Even if your kindergarten is not using Storypark, you have access to the Teachers’ Toolbox. More presentations will be added as we recieve them. We hope to put them on the website shortly, but over time we are moving to use Storypark for our professional development resources. If you are looking on Storypark without using the link above, you will find the presentations are under “planning” on the Teachers’ Toolbox. Please note that Cam Calkoen’s presentation is not availabile, however he has a website, accessed here, which provides a lot of the information that will have inspired you during the conference. Those who attended Glenda Rowe’s presentation at conference, (and those who didn’t) may be interested in following up on a test that looks at unconcious bias. Glenda’s presentation emphasised that teachers have an obligation to promote and protect the principles of human rights, sustainability and social justice. She used the teachers’ Code of Professional Responsibility as the basis for her presentation. Here’s a link to the code, with examples. Glenda’s presentation is on Storypark in the Teachers’ Toolbox, under ‘planning’ along with other presentations from conference 2018. Harvard University has developed an online test to examine biases. Here’s the link. Tonight a summit is being held in Porirua to discuss the future of education for our Pasifika children. All of the Pasifika community is encouraged to attend, this includes church ministers/leaders/groups in Porirua, Pasifika parents or parents of Pasifika children, Pasifika children aged from 5-12, 13-17, 18+ youth, caregivers of Pasifika children, teachers, principals, teachers aides who are either Pasifika or teach Pasifika learners from ECE to tertiary, parents of children in learning support or with disabilities, Boards of Trustees or Management Committee members in ECE services and schools with high Pasifika numbers, Pasifika workers in the education sector wide. 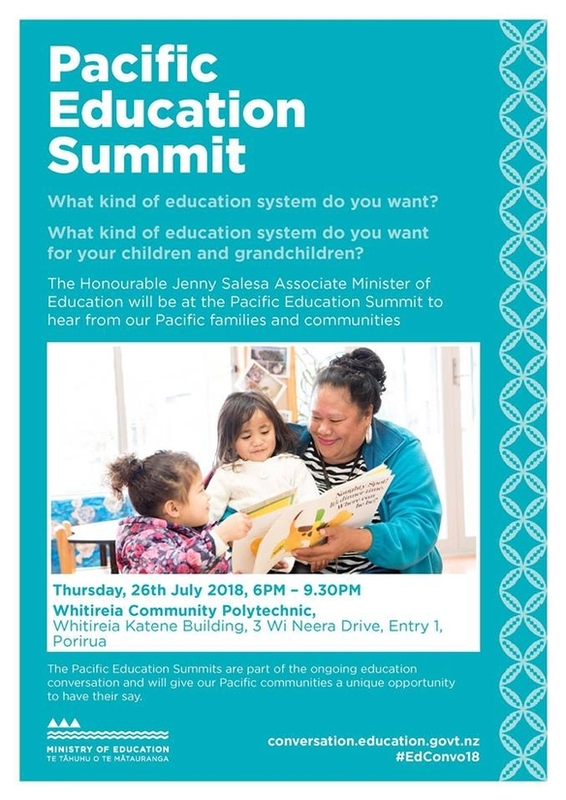 This is a community summit discussing Pacific Education so everyone attending is Community. Your families may be starting to ask about Term 3 requests for Whanau Contributions. Feel free to let them know that these will be emailed out later next week. Hard copies will also be delivered to kindergartens for distribution through “child pockets”. So that we have the most up to date information for our request letters can you please try and have all your children’s enrolment records in Infocare up to date by the end of day on Tuesday 31st July 2018. Tania or Cathryn will follow up with you next Monday if they have any questions related to your records. A reminder that ALL supplier invoices, receipts, and reimbursements that are emailed/sent to accounts for payment must include details of account and department codes. The accounts code list has been recently updated to include new codes (e.g. 2045 Targeted Funding For Disadvantage) and highlight those expenses now paid for by the Association (e.g. 2508 Pest Services, 2502 Alarm Monitoring and Security etc.). If you require a copy of the new account code list please email accounts@wmkindergarten.org.nz for a copy. The Ministry for Pacific Peoples (the Ministry) supports community efforts to encourage the preservation and retention of the Cook Islands language by Cook Islanders living in New Zealand. In 2012 the Ministry in partnership with the Cook Islands Development Agency New Zealand (CIDANZ) and the Human Rights Commission (HRC) delivered the first Cook Islands Language Week. Since 2012, engagement in Cook Islands Language Week has grown. The week is now celebrated across New Zealand through schools, tertiary institutions, workplaces and communities. Cook Islands Language Week is a chance for all Kiwis to celebrate the rich language and culture of the Cook Islands. The Cook Islands community are the second largest Pacific ethnic group in New Zealand (after Samoans) making up 20% (61,839) of the Pacific population (295,941) with 59.5% (36,810) living in the Auckland region (Census 2013). The Ministry has also worked with Te Papa to develop an online language learning resource, Te ’Epetoma o te reo Māori Kūki ’Āirani, to help learners of reo Māori Kūki ’Āirani. It's ideal for Cook Islands language speakers, enthusiasts, schools, workplaces and community groups. 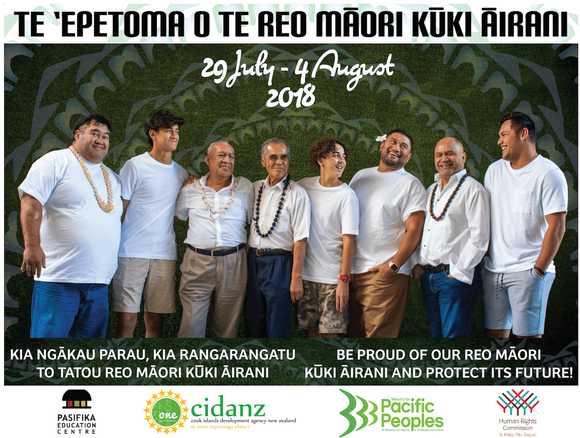 details of how to take part in a nation-wide initiative to recognise reo Māori Kūki ’Āirani Champions (Cook Islands Māori Language Champions). We are continuing to work with Vodafone and BOS to move kindergartens to faster internet services (VDSL or Fibre). Unfortunately, due to unexpected delays it is taking longer than we were hoping to complete this process. We will keep in touch with you as we work through this process – as we receive advice from Vodafone about the scheduling of changes at your kindergarten Tania Braybrook will call to advise when you can expect Chorus and BOS workers on site. If you have any questions about this project, or the next steps, please call or email Jane Braun (027 528 8993) or Tania Braybrook (021 375 894) at the Association Office. 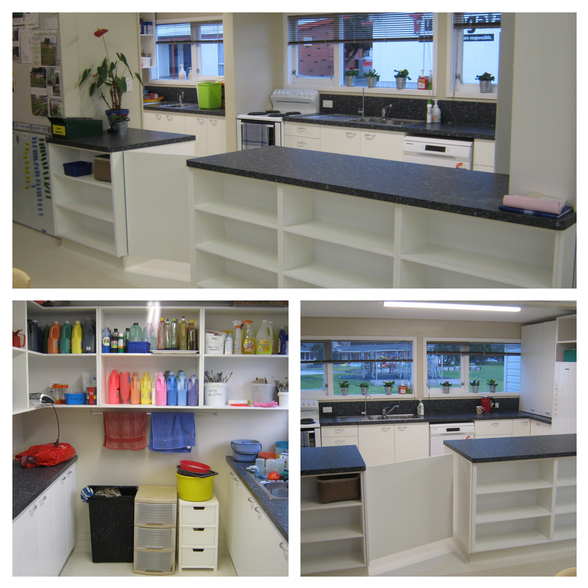 The property team were busy over the term break with a number of large jobs undertaken while the kindergartens were closed. The teaching teams at both Brian Webb and Ngahina Kindergartens were very excited to return to their kindergartens and their new kitchens. They look amazing! 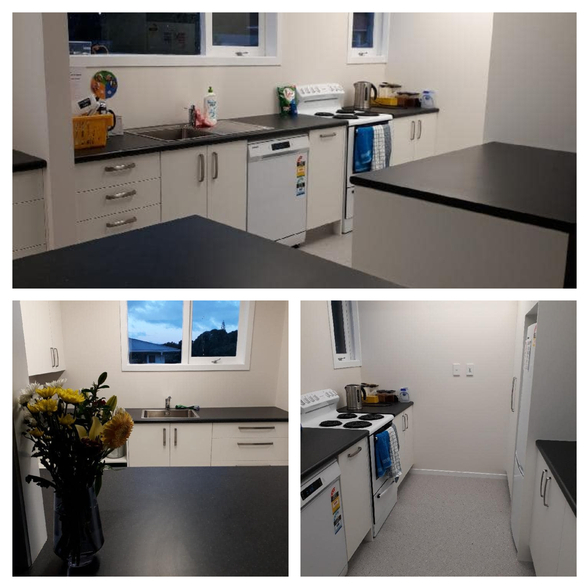 There also a major redevelopment being undertaken at Fanau Pasifika and while this is being done the children have been welcomed in to Te Timatanga Hou and Arohanui Kindergartens. We will keep you up to date with progress in the next few Kōreros. Just a reminder that Rob and Lorraine are away returning Wednesday 8th August 2018. PA1’s will be processed as per usual however any bigger property works, that are not urgent, will be looked at when Rob returns in August. Primary school teachers are likely to strike for a whole day next month instead of half a day as originally planned. Teachers have voted already for a half day strike but many asked their union, NZEI Te Riu Roa, to organise stronger industrial action, because of concerns about the pay offer, workload and the teacher shortage. A ballot is taking place on the one day strike, scheduled for August 15th. The teachers have been in negotiations to renew their collective agreement, and have been offered pay increases ranging from 2.2 per cent to 4.7 per cent a year for three years. Teachers had claimed a 16 per cent pay rise over two years. 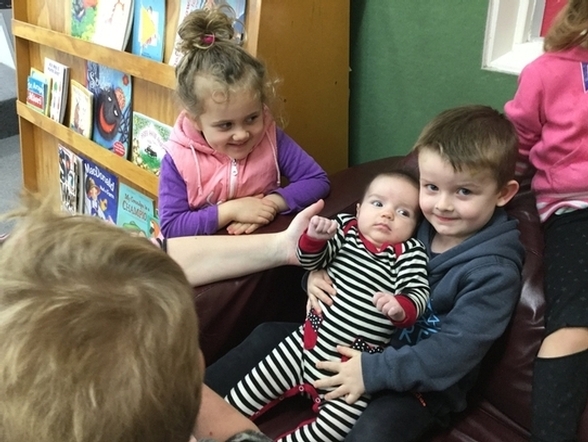 Kindergarten teachers’ pay is linked to primary teachers’ pay, with a clause in the Kindergarten Teachers Collective Agreement saying any increase would be passed on. Doris Nicholson celebrated their good friend Des’ 90th birthday!!! Des is a well-known figure in the community and has been a friend of the kindergarten for many years! 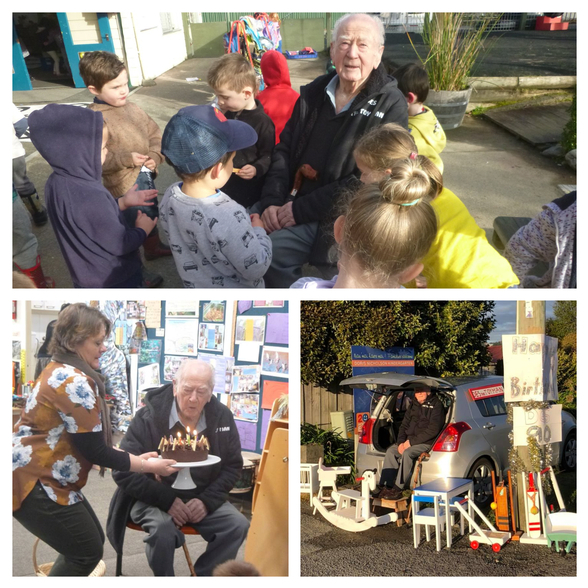 Carterton had a very special visitor! 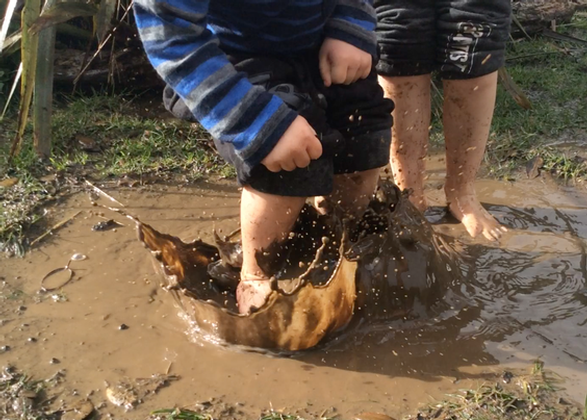 Waikanae children made the most of the wet weather! Just a reminder of our upcycling challenge - send us photos of transformations you have made at your kindergarten! 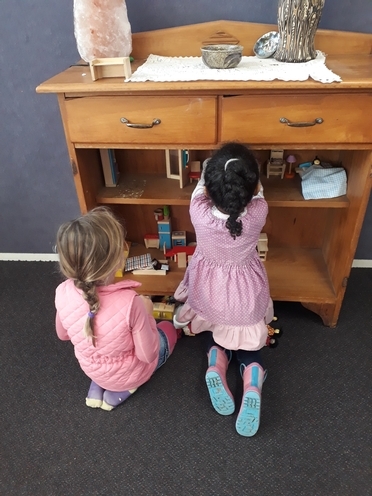 Here’s the one from Kahurangi Kindergarten that was in the Kōrero a couple of weeks back where a dresser has been reused as a doll’s house. Email suggestions and photos tokorero@wmkindergartens.org.nz. Who says pool noodles are just for the water? These are really versatile and can be used in endless ways. The flexibility of the colorful pool noodles allows for them to be shaped and molded in a number of ways, as you'll see from this clever idea below. How about a little archery practice, or a bean bag toss? Pool noodles and duct tape go a long way toward building fun.